Q. Crepereius Rocus was moneyer for the year 72 BC. He is not otherwise known, but struck several coins bearing representations of Venus and Neptune, the gods of Corinth, from which it may be inferred that he had some connection with that city, perhaps after its restoration by Caesar. 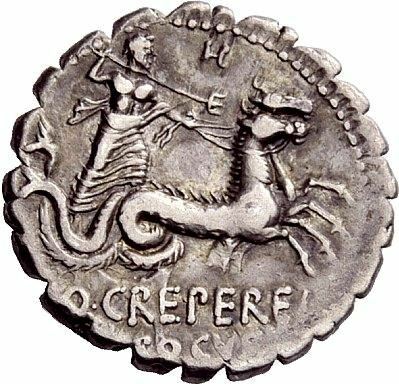 Crepereia was a plebeian family of equestrian rank at Rome. The family appears in history from the first century BC to the first or second century AD. It was distinguished for the strict discipline of its members, but otherwise very little is known.